The decision by Kellogg’s, which makes Pringles, Eggo waffles, as well as Special K and Frosted Flakes cereals, among others, will make virtually no revenue impact on Breitbart.com says the conservative website. It does, however, represent an escalation in the war by leftist companies like Target and Allstate against conservative customers whose “values” propelled Donald Trump into the White House. According to Breitbart, Kellogg’s offered no examples of how Breitbart’s 45 million monthly readers fail to align with the breakfast maker’s values. Indeed, the move appears to be one more example of an out-of-touch corporation embracing false left-wing narratives used to cynically smear the hard-working Americans that populate this nation’s heartland. Kellogg's would also appear to be another example of a Far-Left elitist management being out of sync with the values of its conservative shop floor employees. Kellogg’s is the largest private employer in Battle Creek, Calhoun County, Michigan where the conservative – populists Donald Trump and Mike Pence, backed by Breitbart, defeated Far-Left Democrats Hillary Clinton and Tim Kaine 31,489 to 24,154 in a 23-point blowout. In response to Kellogg’s advertising boycott of Breitbart, the popular conservative website has launched its own counter-boycott of Kellogg’s urging its populist – conservative readers to boycott the mega-brand’s processed food products. 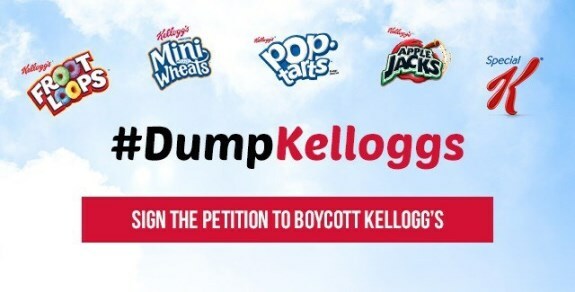 The #DumpKelloggs petition encourages Breitbart’s vast readership and the followers of its #1 in the world political Facebook and Twitter pages to ban bigotry from the breakfast table by boycotting Kellogg’s products. Submitted by ONTIME on Thu, 12/01/2016 - 14:58. Submitted by Mistrbill on Thu, 12/01/2016 - 12:45. I tried to post this article on my Facebook for 300 or more to see and it came up "Blocked" for subject matter. It appears that we conservatives are going to have to boycott Facebook!